The improvement is huge, not only from a design standpoint, but also in terms of usability. The new website focuses on providing a better experience for customers by featuring information that is relevant at different stages of the decision process, as well as easy contact and application points. 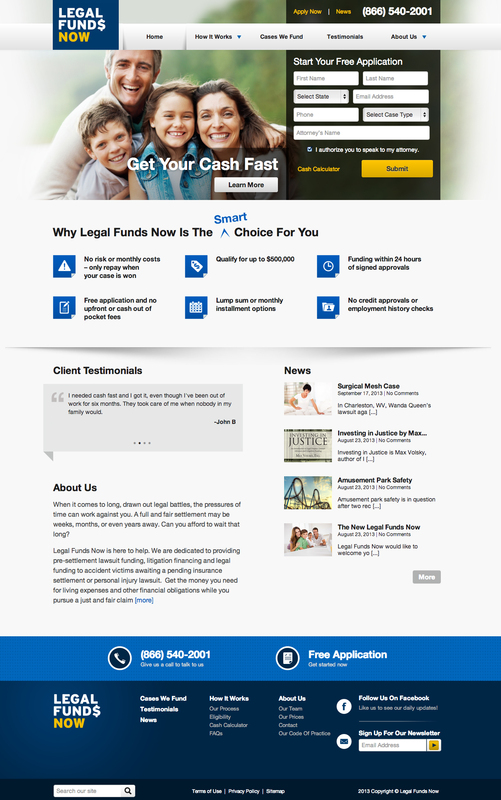 Legal Funds Now wanted a modern design that encouraged people to engage with the website. We found that a majority of their hang-ups were coming during the sign-up process. Many times the legal documents you have to fill out for a site like LFN are overwhelming and intimidating. To make the process as streamline as possible for potential clients, we needed to create a simple ‘fill in the box,’ step by step process. This easy to understand flow of information gathering would allow LFN to better connect with users and assess their specific needs right away. Prior to taking the first steps in the site overhaul, we worked closely with LFN to design a new company logo. If your logo is your brand of course it’s important to spend time making it pop. 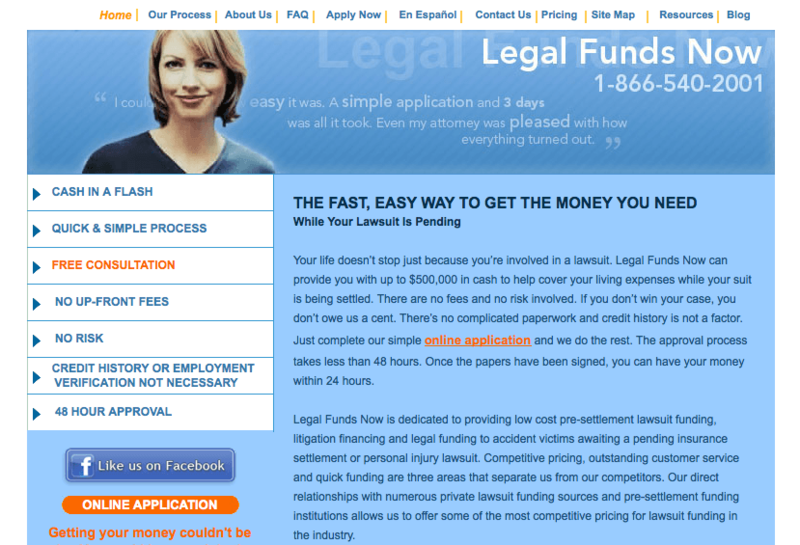 When the logo adventure came to an end, it was time to focus on rebuilding the Legal Funds Now website from the ground up. This is oftentimes how we approach development at Webonise, and it’s one of the distinct factors that sets us apart from other development companies. Now, time to Brainstorm. Who are our users? In order to answer this, we had to thoroughly understand the business logic behind Legal Funds Now. Once you understand the business through and through, you understand the customer, and once you understand the customer you can create the perfect UX that is specific to them. If you’re hit by a drunk driver and while fighting your case, you are financially stressed, Legal Funds Now helps get you the funding you need to pursue a fair settlement. The website contains a lot of very valuable information that users need to access as quickly as possible. That being said, we focused on structuring the website content in the simplest way possible. We understood that in this case content was king and we developed a new, organized, intuitive site architecture that would allow users to easily locate the exact information they care about most. This website was not built to be a virtual yellow pages on all things legal and funding, good for reading and nothing more. We took care of the more functional aspects as well. Example: We built a short application whose purpose was to make sure the user is retained. Another important requirement was building something easy to manage and customize. In order for the client to handle the content of the site on their own and upon convenience, we decided to go with Wordpress. The whole idea behind choosing Wordpress was that it allowed the client to freely modify their own website and tweak and update the information on a regular basis, without needing a complete re-design to achieve this. In order to help the RIGHT users find Legal Funds Now, we needed to implement several features to increase the company’s online searchabilty, like a blog and specific case type pages, which is hugely important for any online brand. The ability to completely understand and relate to the client’s user base is imperative when building web and mobile applications. As a business, it’s easy to put on your marketing hat and forget that in order to gain the trust of an audience you need to draw them in through great design and user experience. The user engagement and user satisfaction that you achieve from this is, in fact, helping you achieve your end marketing goals. Luckily this is something that Legal Funds Now embraced wholeheartedly, and in turn we were able to build a great product that works as flawless as it looks.